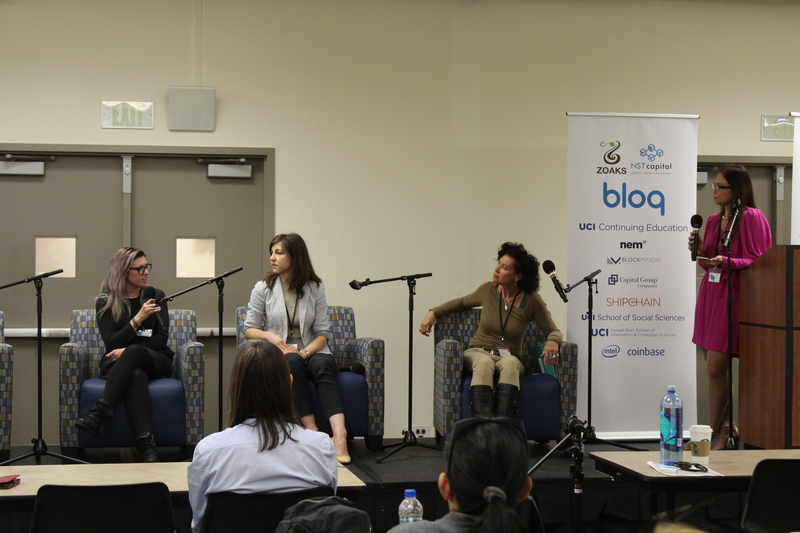 Blockchain at UCI, an ecosystem for blockchain education, networking and development at the UC Irvine campus, recently hosted the 2018 Women in Blockchain Summit at UCI to emphasize the need for female and minority voices in blockchain. The one day event brought together 20 leaders from the blockchain industry with 400 enthusiastic attendees to discuss the new technology and its impact on diversity. Using popular cryptocurrency Bitcoin as an example, the blockchain technology replaces centralized ledger systems currently used by banks with a decentralized system administered by a series of “miners” who validate these digital transactions made in the digital currency. As a result, it is more difficult for hackers to infiltrate an account or institution as the ledger is validated by multiple sources, rather than just one. For this reason, this technology is not only applicable to cryptocurrency, but can be used for a plethora of other applications that need to protect and validate sensitive information. The first portion of the day consisted of panels from women in the blockchain industry, including one that was focused on social impact and its application in finance, tech and cybersecurity. The second portion included three panels that discussed more technical skills needed to infiltrate and develop blockchain, like smart contracts, virtual jurisdiction, investment, and more. The event concluded with a keynote discussion with Perianne Boring, founder and president, Chamber of Digital Commerce and Jordan Kruger, director of research and operations, Bloq, a company that delivers enterprise-grade blockchain technology to leading companies worldwide. They emphasized the need to be actively involved in this developing technology and to never let prejudice stop anyone from affecting change. The 2018 Women in Blockchain Summit reminded attendees of the endless opportunities in technology as well as the need to make those opportunities accessible to a diverse set of smart and capable candidates. The opportunity to shape the tech industry evolution into a diverse and accepting business is more available than ever.